Kino Flo’s award-winning FreeStyle 41 unleashes your creative side with a quick-release feature to remove the LED panel from the fixture, cutting the weight nearly in half (from 7.3kg to 4.4kg) and creating a smaller form factor for better rigging flexibility. The LED panel’s corner bumpers can be used to hang from rope or wire. The panel also takes a Twist-On mount for working on light stands. 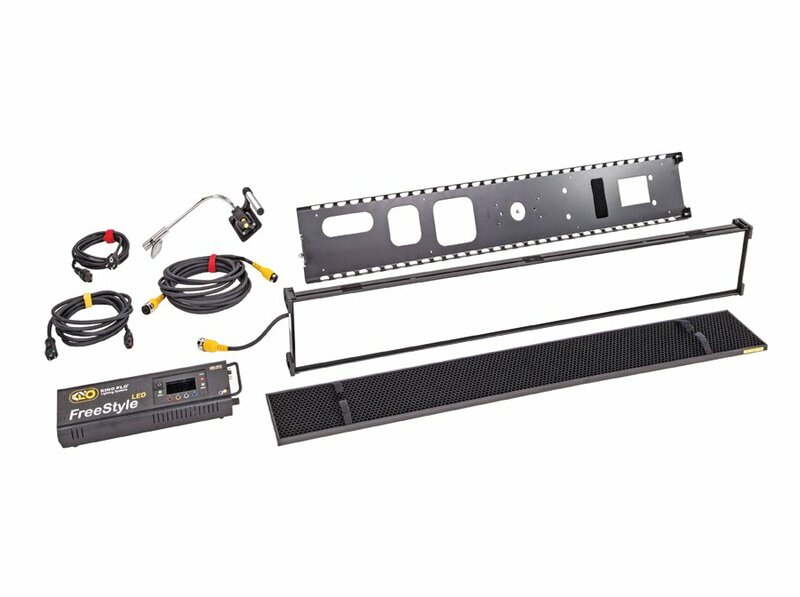 The Freestyle 41 comes complete with the full color, programmable FreeStyle controller, Head Cable (25ft), complete fixture with removable LED panel, and a twist-on KinoGrip Center Mount. Honeycomb 90° or 60° louvers, mounted with Velcro, give direction to the light, and when removed the panel displays a broad soft beam across the set. The FreeStyle 41 is known for its >96 white light, full hue and saturation color, cinema gel choices, and RGB chromatic selection via the AC/DC FreeStyle 150Watt controller. It has built-in Lumen Radio® wireless DMX; no extra cost for wireless receiver accessories. The light can also be operated directly up to 50 feet away from the controller via Kino Flo head cables. The Freestyle's driver technology achieves bright, soft light with continuous dimming from 100% to 0% on a linear or square curve without flicker at higher camera speeds or at varied shutter angles. There is no light level change when shifting from 2500K to 9900K, and the color doesn't change when the light levels rise or fall. Color and luminosity remain stable over the rated life of the LED's using Kino Flo's advanced True Match® daylight and tungsten color management system, which has been an unqualified success since Kino Flo introduced the idea of soft panel True Match Celeb Studio LED’s six years ago. Passive cooling keeps the LED’s in good shape for a longer usable life than fixtures that require electric fans.